We retrospectively reviewed 801 consecutive patients undergoing a laparoscopic cholecystectomy. These were performed in a single institution between January 2006 and December 2008. Of these patients, 18 were HIV positive. Of the 18 HIV positive patients, 11 were actively taking HAART medication. The CD4 count was available in 14 patients (mean 264, range 33-500). 3 out of 18 patients were converted to an open cholecystectomy, for a conversion rate of 16.7%. This was higher than the conversion rate in the general population (57/783, 7.3%). In addition, 4 patients developed significant post-operative complications. One developed a biliary leak, which was managed with a drain and a sphincterotomy. One developed renal failure, which resolved without dialysis. One developed pneumonia, requiring intubation. One was re-admitted to the ICU in septic shock and later expired on the tenth post-operative day. This complication rate was higher than that seen in the general population (42/783, 5.4%). Length of stay differed between the two groups as well. In the HIV patients length of stay averaged 8.9 days, compared with 4.3 days in the general population. This difference was more clearly seen in the amount of time spent in the hospital after surgery. In the HIV group the average was 5.7 days compared with 2.0 days in the general population. In this case series, HIV infection was associated with a higher conversion rate, a higher complication rate, and therefore a longer length of stay. The reasons for each conversion were evaluated. In each case there was an anatomical or technical problem that was seemingly unrelated to the HIV status. With regard to the complications, all four of these patients had other significant medical diseases at the time of their cholecystectomy. 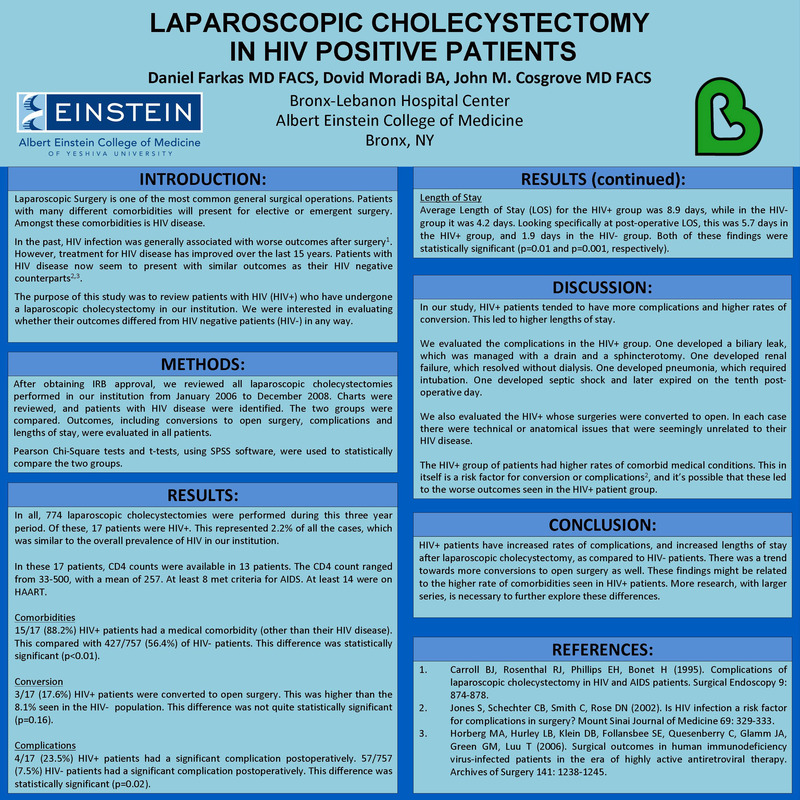 Our conclusion is that HIV disease might be associated with an increased rate of complications and conversions in laparoscopic cholecystectomies. However, to better evaluate whether it is an independent risk factor, more research with a larger series of patients is still necessary.